With the thick cloud cover we had last week, it was lucky to get to see the moon at all. 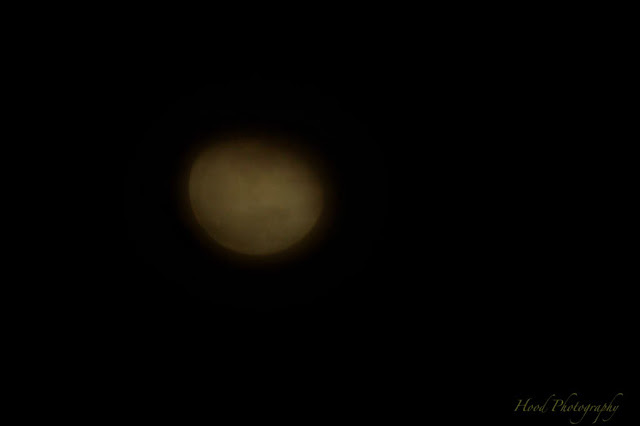 I missed the full moon, but did catch this one a few days later, peeking thru the thin part of the fog. A different and interesting shot of the moon. I have a hard time getting good pictures of it. The moon really makes for a lovely sight and post. This is quite possibly better than a shot of the full moon - everyone does that - but how many have such a beautiful photo of a lovely, foggy moon? I think this is a very special and great photo of the Moon. Because it's "so honest" or "My Moon this evening". Besides, I wanna go back to OR. OK, living in Norway and not free to go where I would like to when I want to.